I don’t want my readers to feel obligated to watch this video. I understand it is hard to watch but I wanted to share why I decided to watch it eventually. Ani (nun) Palden Choetso. She set herself on fire in Tibet on Nov. 3rd 2011. I saw the video being posted on facebook walls. I didn’t want to look at it at first, the picture was graphic enough. I sat on it for 5 days, afraid to look at the content. Afraid to witness her, a real person, burning. She was number eleven of the twelve immolations that have taken place across Tibet. They were happening so quickly, they started to slowly become a lump of numbers. In the pictures that came out, they all looked like a spark of fire, a charcoaled body, almost unrecognizable, almost not real. It was heartbreaking to hear of the self-immolations. But how are you suppose to react when a photo and, later, video emerges? Witnessing the realness of what you heard. How are you suppose to digest it? Flesh and bone, bit by bit, engulfed by the flames that consumed them. I watched the two other videos of the monks who self-immolated out of obligation to witness their strength and conviction in their truth. I was trying to find the strength to bear witness, as they had hoped, to their voices. When Palden Choetso’s video came out, I noticed the video still of her in the midst of thick orange flames and I became afraid. This was not the same as the lifeless char coaled picture of the figure that came out after her immolation. I was afraid to witness a living person, moving, breathing, screaming, burning, and dying. Up until this video, Choetso had been number 11. A faceless number eleven out of the twelve that “Tibet experts” like Dibyesh Anand spoke of. After BBC failed to air the footage, I became angry. How could they fail to share the message Choetso gave her life for? What are they afraid of? I don’t really know the answer to this question and I don’t care. I decided to finally watch the video, not because I felt obligated. Choetso died in flames hoping we would all hear her. In the video, Choetso became real. No longer a lifeless body but a living, moving, shouting, and finally collapsing, person. What are you suppose to do after bearing witness to all her truth and conviction? 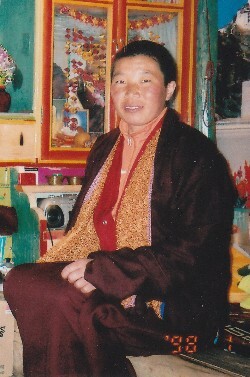 In the video, Choetso is approached by a Tibetan women in a chuba. She takes out a Khata (White Scarf) and offers it to Choetso’s burning body for her ultimate sacrifice for the people around her and beyond. Others offer prayers for her journey after death, as she slowly disappears in the flames. While Anad is busy accusing Tibetan political groups for “encouraging” the immolations, he patronizes and forgets those engulfed by flames were not only lumps of numbers but individuals to those of us who’ve been affected by her death, their deaths. Choetso’s videos, sent by Tibetan who witness the act with great risk, show a living, breathing, burning, humanity, giving herself away, like a true Bodhisattva. Choetso was more than a burning lump of flesh. Her video made me question, like the woman who offered Choetso a sacred Khata as she lay dying, what am I willing to offer?